2017 was a devastating year for countries most vulnerable to natural disasters. Throughout the year, a high frequency of catastrophic flooding, hurricanes, storms and wildfires ravaged the world, incurring double the economic loss and cost as opposed to similar disasters that occurred in 2016. According to insurance and reinsurance firm Munich Re, natural disasters in 2017 globally cost an estimated US$340 billion, the second-highest annual loss ever recorded. 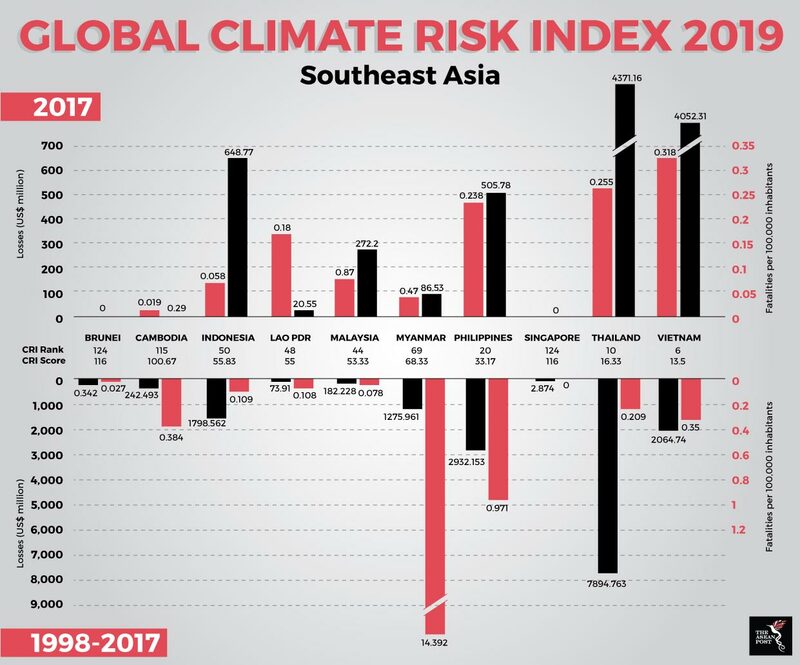 Two Southeast Asian countries, Vietnam and Thailand, have made it onto the list of top 10 most affected countries by weather-related events in 2017, both in terms of fatalities and economic losses, according to the Global Climate Risk Index 2019, which was released yesterday. The year saw the region losing 950 lives and an estimated US$9.9 billion to weather-based disasters, collectively. A report by think tank Germanwatch based on data from the Munich Re NatCatSERVICE, also ranked countries most affected by weather-based disaster in the last 20 years between 1998-2017. In the longer-term list, three countries from the region, namely Myanmar, the Philippines and Vietnam, were included, ranking third, fifth and ninth, respectively. Vietnam, which was ranked fifth on the list, up one place from last year, experienced 298 reported deaths and US$4.05 billion or 0.63 percent of its gross domestic products (GDP) in economic loss for 2017. The country experienced persistent weather extremes in 2017, including tropical storm Talas in July, tropical storms Kirogi and Damrey in November, as well as a blasting of storms in April and typhoons towards the end of the year. Thailand, ranked 10th on the list, up 10 places from last year, recorded 176 deaths and an estimated US$4.37 billion in economic losses, representing 0.35 percent of its GDP. 2017 started on a bad note for the country, with leftover heavy flooding from 2016 killing 40 in January alone. A tidal wave triggered by extreme rainfall in southern Thailand claimed at least 18 lives and flooded thousands of villages, turning roads into rivers and farmland into lakes. Myanmar earned its spot on the longer-term list due to Cyclone Nargis that slammed into the country in 2008, causing more than 95 percent of the damage and fatalities in the country over the past decade. Brunei and Singapore joined the group of countries most unaffected by weather-based disasters in 2017, with no deaths and no significant losses recorded. Looking at the statistics or reading a report on disasters, sometimes it is hard to really grasp the gravity of the situation. According to Lloyd Pascal, Director of the Environmental Coordinating Unit for Domenica’s Ministry of Environment, Natural Resources, Physical Planning and Fisheries, for those affected, life after disasters often falls into two categories: before the event and after the event. Pascal, who is a climate negotiator for Domenica and is currently attending the 24th Conference of the Parties to the United Nations Framework Convention on Climate Change (UNFCCC) (COP24), said that the location of his country puts it in the direct path of the Atlantic hurricanes. In September 2017, the Category 5 Hurricane Maria hit Domenica, damaging 90 percent of housing, severely affecting 90 percent of its 72,000 population, and killing 72 people. Domenica was ranked third most affected country in the report, up 117 spots from the year before. “Never before in the existence of mankind on this planet has any one country suffered so much from one single event of catastrophe. We are living in a time of severe weather events happening more frequently and intensely than we used to know. “We have been negotiating since this convention in 1992 in Rio. It is 26 years, already a lifetime. But the weakest members of the human family living in this world are not given any attention in this climate change business. We think we need better solidarity, we are not doing what is required. The people who have the means of reducing their emissions are not doing it,” said Pascal, whose home was also damaged by the hurricane. The reality for those impacted by the paralysing destruction is devastating. They are unable to recover their daily lives even after many years. It is undeniable that climate change has a hand in bringing about these disasters. For those sitting at the COP24 negotiating table, it is their moral duty to take the more vulnerable among us into consideration while making decisions. 2017 is but a foretaste of what is to come if we continue on this trajectory.